NOTE: ALWAYS use a body harness, not a collar, for his leash. Jerking or hard pulling can injure his eyes or neck. What's good and bad about the Pug? Here's a 33-second video that shows how cute a Pug can be. If you want to learn all the secrets of having a happy and well-behaved Pug in your family, then this Special Report at $9.97 is just for you. 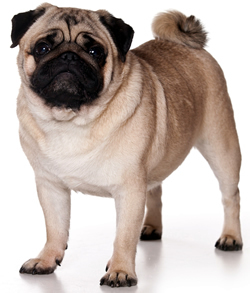 This is a one-stop 100+-page report with all the information you need to live with and care for your Pug from puppy to senior canine. Pick up the best techniques for brushing and bathing your Pug. Don't overlook the need for regular dental care and pawicures. There are potential problems of getting a dog from an animal shelter or rescue group. Understand the common terms you'll find in ontracts or bills of sale from breeders and non-profit shelters or rescue groups. Understand what puppy lemon laws cover and learn which states have laws or are trying to pass them. Understand what you should expect from a breeder’s warranty. Get the secrets of how to inspect a canine and my one tried and true technique to test temperament. Learn what to expect from your puppy. Find out why registration isn’t a guarantee of a healthy, happy dog. We provide an illustration identifying dog body parts so the breed standard makes some sense. You’ll get a list of the health tests and certificates that a breeder or other seller should provide you. Find out how to puppy proof your home. No, you don’t need to spend a thousand dollars. For instance, a cardboard box with a waterproof, washable mattress makes a fine bed until your puppy is done teething. There is a technique that works. We’ll address using the outdoors for a potty as well as using a doggy litter tray (especially nice for an older dog). Find out why it’s a bad idea to paper train your dog. If you work all day, you’ll see a schedule that works well for you and your dog. You’ll also learn why I don’t recommend using walks for potty time. Many households have multiple pets. You’ll pick up several tips on the smoothest way to bring a new puppy or dog into your household. Cats and dogs can live in harmony especially if you start everyone off on the right paw. There’s one technique that I consider most important for a happy canine/human relationship. You’ll also learn the four things you must do to remain the leader of your pack and prevent aggression and dominance problems. You’ll learn the 5 commands you should teach your Pug – for his safety and yours. We don’t expect you to turn your dog into a circus performer. We offer tips for 10-minute training segments. It’s getting more affordable but most dog owners still aren’t insuring their pets. Learn why veterinarian fees are rising so fast. Find out what the airlines require. Don’t leave him behind if leave the USA. It’s easier to take a dog with you than it’s ever been. Your dog will slow down and need a little extra tender care as he ages – just as you will. We’ll provide some tips on how you can make his sunset years enjoyable for you both. Learn when it's time to say good-bye. Find out how to establish a trust fund to care for your dog after your death (many states now allow them). Learn what to do if there’s no one who could care for your dog if you’re not around. Get tips on minor first aid treatments. Know what to do if you think your dog's been poisoned. first-time dog owner can understand and follow. I’m a certified canine specialist and operate the www.ToyBreeds.com website about Toy dog breeds. I don’t claim to be a dog whisperer, dog psychiatrist, dog psychic or any other faddish title that people can call themselves because no Government agency regulates them. My reports are from 20-years of real experience, not fads or theoretical concepts. Just canine common sense. It even has a table of contents and index so you can find things. 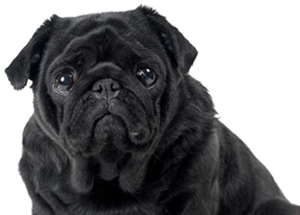 Live with a Pug – Learn all the secrets to having a happy and well-behaved Pug. More than 100-pages of information, just $9.97. BONUS: Dog Food 101 – Answers to the questions I'm most frequently asked on commercial, organic, homemade and natural dog foods. Find out why I don't recommend bones or the BARF diet. This product is a digital download. There isn't anything being mailed to you. The Special Report is in PDF format and requires the Adobe Reader. The delivery is instant after you make your purchase - even if it's 3:00 a.m. where you are. ToyBreeds.com never sees your credit card information and your data is not kept on file. We will never share, sell or rent out your e-mail address or other information. You will never hear from me unless you initiate the correspondence or there is a problem fulfilling your order. You cannot lose with our 100%, ironclad, money back guarantee! If it doesn’t meet your needs, we’ll refund your purchase price. No-questions asked. Best wishes for a long and happy life with your Pug. 2Checkout.com Inc. (Ohio, USA) is a payment facilitator for goods and services provided by ToyBreeds.com.